Our online weight management programme will help you to take control of your weight. No more fad diets - reach and maintain a healthy weight! Our online service provides you with private access to one of our weight loss experts. At a fraction of the cost of a personal trainer, you’ll receive the individual attention you need to achieve your weight loss goals. You’re not just a number to us – we get to know your individual circumstances and provide you with an individualised weight-loss plan. We guarantee a personal service to all our clients – you can email us at any time, as often as you like, and we promise to respond promptly within normal business hours. We’ll be your personal weight loss guru, at a fraction of the cost of a personal trainer or traditional weight loss programme. We’re so confident that we offer a full money back guarantee – plus 10%! If you are not entirely satisfied with our service after your first month, just let us know and we’ll refund 110 % of your fee. Our weight loss system is based on the latest scientific research. Our approach is holistic – we look at your levels of physical activity, the type and amount of food you eat, your sleep patterns, your leisure habits – and we use this information to develop a weight control programme that works for you. 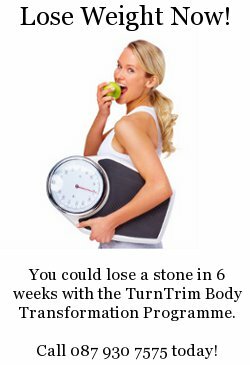 TurnTrim online will help you to take control of your habits and your environment so that healthy choices become second-nature. We help you to discover the reasons behind your personal weight issue, and we give you the tools you need to take control of your weight. Contact us now and TurnTrim. We look forward to hearing from you!